question_answer1) The picture graph shows the number of cookies 5 children ate. Study the graph and answer the given questions. Who ate the maximum number of cookies? question_answer2) The picture graph shows the number of cookies 5 children ate. Study the graph and answer the given questions. How many cookies did Chitra eat? question_answer3) The picture graph shows the number of cookies 5 children ate. Study the graph and answer the given questions. Which two children ate 18 cookies altogether? 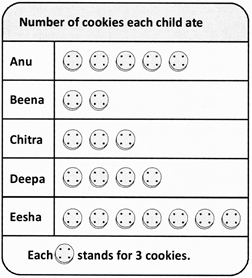 question_answer4) The picture graph shows the number of cookies 5 children ate. Study the graph and answer the given questions. Who ate 6 cookies more than Beena? 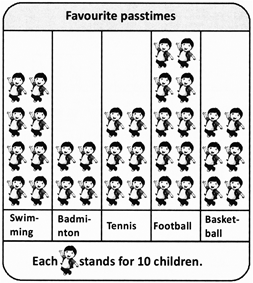 question_answer5) The picture graph shows the favourite passtimes of a group of children. Study the graph and answer the given questions. If 45 boys like swimming, how many girls like swimming? question_answer6) The picture graph shows the favourite passtimes of a group of children. Study the graph and answer the given questions. Which is the most popular pass time? question_answer7) The picture graph shows the favourite passtimes of a group of children. Study the graph and answer the given questions. If the same number of boys and girls like basketball, how many boys like basketball? question_answer8) Use the information to answer the given questions. 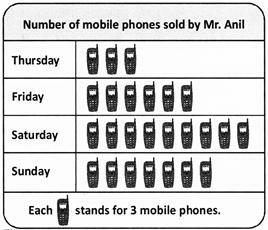 How many mobile phones did Mr. Anil sell on Saturday and Sunday? question_answer9) Use the information to answer the given questions. Mr. Anil sold 3 more mobile phones on Friday. On which day was the same number of mobile phones sold? question_answer10) The Kings Fun Fair is in the town! Play the games to win token and exchange for toys. Sandhya won 10 tokens at the fun fair. 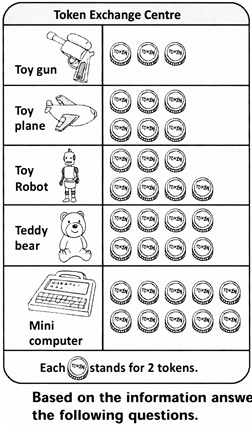 How many more tokens does she need to exchange for a toy robot? question_answer11) The Kings Fun Fair is in the town! Play the games to win token and exchange for toys. Anand won twice as many tokens as Sandhya. Which item can he get? question_answer12) The Kings Fun Fair is in the town! Play the games to win token and exchange for toys. Jasmine had just enough tokens to exchange for a teddy bear. If she wanted to exchange her tokens for 2 toy planes, how many more tokens will she need? question_answer13) The Kings Fun Fair is in the town! Play the games to win token and exchange for toys. Krishna won 30 tokens. He exchanged all of them for two toys. Which two toys did he choose? question_answer14) Look at the picture graph and answer the questions that follow. How many more cars were parked on the 3rd floor than on the 5th floor? question_answer15) Look at the picture graph and answer the questions that follow. 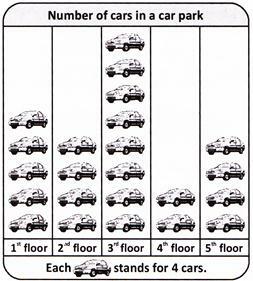 On which two floors is 12 the difference of cars parked? question_answer16) Look at the picture graph and answer the questions that follow. The charges for a parking car on the 4th floor is Rs. 10 for a day. How much must company A pay for their cars parked on 4th floor? question_answer17) The graph shows the ages of 5 children. How many years older than the youngest child is the oldest child? question_answer18) The graph shows the ages of 5 children. By how many years respectively is Peter younger than Gaurav and older than Ali? question_answer19) What is the difference in ages of Zeenat and Vishnu? question_answer20) What is the total age of the five children? question_answer21) If each stands for 4 flowers, how many flowers are there in the picture given? question_answer22) The graph shows the number of oranges in baskets A, B and C.
Each stands for 3 oranges. There are no rotten oranges in baskets A and C. There are 3 rotten oranges in basket B. How many good oranges are there in all? question_answer23) Observe the pictograph given. Each stands for 4 T-shirts. How many less number of T-shirts does Aman have than that of Arjun and Chandra? question_answer24) Study the pictograph given. Each stands for 3 buttons. If there is a total of 24 buttons, how many should there be in the column for yellow buttons? question_answer25) If each stands 4 ladybirds, for how many ladybirds does stands? question_answer26) stand for 35 cherries. For how many cherries does stand? question_answer27) There are 12 people at the playground. There are 18 more people at the cinema than at the shopping centre. For how many people does each stand? question_answer28) There are 100 people at the playground and shopping centre. For how many people does each stand? question_answer29) The picture graph given shows the number of items in a bakery How many cakes are more than the number of sandwiches? 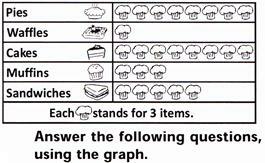 question_answer30) The picture graph given shows the number of items in a bakery What is the total number of pies and muffins? question_answer31) The picture graph given shows the number of items in a bakery Which item is the maximum in number in the bakery? question_answer32) The picture graph given shows the number of items in a bakery Which item number in the bakery? question_answer33) The picture graph given shows the number of items in a bakery 6 sandwiches contain fish and the rest contain ham. How many sandwiches contain ham? question_answer34) The picture graph given shows the number of items in a bakery The pies are packed in boxes of 4. How many boxes of pies are there altogether? question_answer35) The picture graph given shows the number of items in a bakery How many waffles must be made so that there are equal number of waffles and sandwiches? question_answer36) The picture graph given shows the number of eggs collected by a farmer on 5 different days. How many more eggs were collected on Thursday than on Tuesday? question_answer37) The picture graph given shows the number of eggs collected by a farmer on 5 different days. On which day was the maximum number of eggs collected? question_answer38) The picture graph given shows the number of eggs collected by a farmer on 5 different days. On which day were 25 more eggs collected than on Wednesday? question_answer39) The picture graph given shows the number of eggs collected by a farmer on 5 different days. What is the total number of eggs collected on Monday, Tuesday and Wednesday? 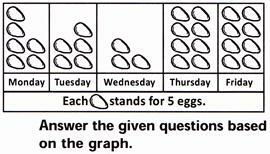 question_answer40) The picture graph given shows the number of eggs collected by a farmer on 5 different days. On which day was the number of eggs collected the same as that on Thursday? question_answer41) The picture graph given shows the number of eggs collected by a farmer on 5 different days. The farmer sells each egg at 20 p. How much money does he earn on Thursday? question_answer42) The graph shows the amount of money that Jayanth earns by working part-time in 4 months. Answer the following questions using the graph In which month did Jayanth earn the maximum money? question_answer43) The graph shows the amount of money that Jayanth earns by working part-time in 4 months. 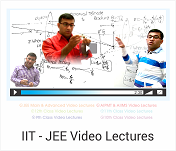 Answer the following questions using the graph In which two months did Jayanth earn a total of Rs. 18? question_answer44) The graph shows the amount of money that Jayanth earns by working part-time in 4 months. Answer the following questions using the graph How much more did Jayanth earn in the month of February than in April? question_answer45) The graph shows the amount of money that Jayanth earns by working part-time in 4 months. 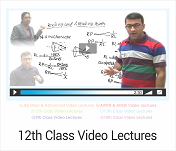 Answer the following questions using the graph Jayanth spent Rs. 3 in the month of January. How much money is remaining with him? question_answer46) The graph shows the amount of money that Jayanth earns by working part-time in 4 months. Answer the following questions using the graph In which month does Jayanth earn twice as much as in March? question_answer47) The graph shows the amount of money that Jayanth earns by working part-time in 4 months. Answer the following questions using the graph If Jayanth earns Rs. 6 more in May than in March, how much does he earn in May?